Latvian pensioners are among the most vulnerable in the European Union when it comes to the risk of poverty, according to data published January 15. 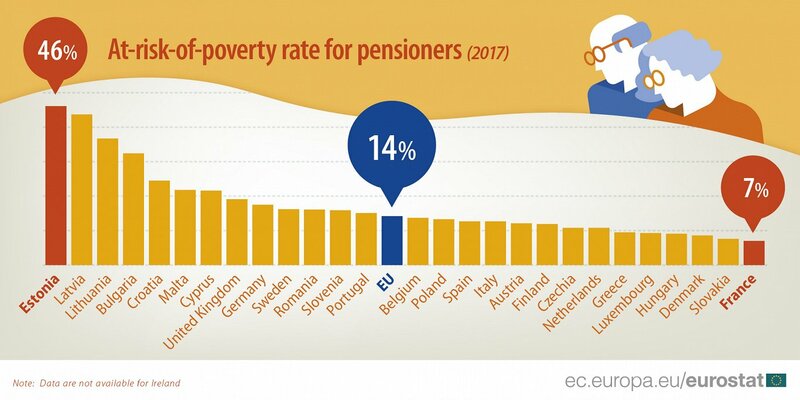 While 1 out of every 7 (14%) of pensioners across the EU were at risk of poverty in 2017, in Latvia the figure was far higher with more than 2 out of every 5 (44%) at risk. Only Estonia recorded a higher level (46%). In the general population, the proportion of individuals identified as being at risk of poverty in the EU in 2017 was 17%. Latvia is also among the four member states where the at-risk-of-poverty rate for female pensioners was more than 10 percentage points (pp) higher than the rate for male pensioners: Estonia (+19 pp), Lithuania (+16 pp), Bulgaria and Latvia (both +15 pp). The EU-wide 2017 at-risk-of-poverty rate of 14.2% is slightly above the figure of 13.8 % in 2016. The rate has been rising gradually since 2013, when it was 12.6 %. Overall in Latvia, more than a quarter of the population (28.2%) is at risk of poverty, the sixth-highest level in the European Union. You can see more statistics on the subject at this dedicated page.